Little Johnny, almost four years old, would rather run around naked than keep his clothes on. Who can blame the active boy when he spends most of his day on a tropical island where the sun smiles down on him and the ocean waves from his front door? His mother, on the other hand, believes that it’s time for Johnny to act his age, and starts him off with new “big boy” red swim trunks. It’s not long before he’s wriggled out of the trunks and back into the comfort of skin alone. No matter what his mother tries to lock him into—buttons, bows, strings, zippers, or “the thingamajig that Johnny rips with that lovely tearing sound,” he simply refuses to stay clothed. When his father suggests a “man-to-man” talk, Johnny begins to imagine all the things he will be able to do—play with friends, kick a soccer ball, or ride the bus to school—if he wears his clothes properly. And humorously imagining his father naked and having to hide behind a tree to pick mangoes is enough to prod the boy into putting on his overalls. 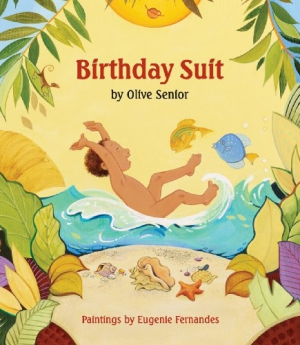 Olive Senior, an award-winning Jamaican poet, short story, and nonfiction writer, taps her Caribbean roots in her first children’s book. She also lends her poetic flair, punctuating Johnny’s resistance with snappy sounds and rhythms. Illustrator Eugenie Fernandes adds to the lush scenery with warm, vibrant paintings that exude as much energy as Johnny himself. Older children will particularly enjoy spotting the various and abundant foods, flora, and sea creatures in this exotic locale. And younger readers who aren’t quite as free-spirited as Johnny will appreciate his dilemma about growing up and his still occasional need to jump in the ocean in his birthday suit.